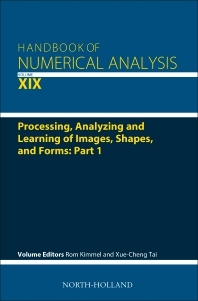 Processing, Analyzing and Learning of Images, Shapes, and Forms: Volume 19, Part One provides a comprehensive survey of the contemporary developments related to the analysis and learning of images, shapes and forms. It covers mathematical models as well as fast computational techniques, and includes new chapters on Alternating diffusion: a geometric approach for sensor fusion, Shape Correspondence and Functional Maps, Geometric models for perception-based image processing, Decomposition schemes for nonconvex composite minimization: theory and applications, Low rank matrix recovery: algorithms and theory, Geometry and learning for deformation shape correspondence, and Factoring scene layout from monocular images in presence of occlusion. Research scientists and graduate students specialising in mathematics, as well as engineers with a basic knowledge in partial differential equations and their numerical approximations. Ron Kimmel is a Professor of Computer Science at the Technion where he holds the Montreal Chair in Sciences. He held a post-doctoral position at UC Berkeley and a visiting professorship at Stanford University. He has worked in various areas of image and shape analysis in computer vision, image processing, and computer graphics. Kimmel's interest in recent years has been non-rigid shape processing and analysis, medical imaging and computational biometry, numerical optimization of problems with a geometric flavor, and applications of metric geometry, deep learning, and differential geometry. Kimmel is an IEEE Fellow for his contributions to image processing and non-rigid shape analysis. He is an author of two books, an editor of one, and an author of numerous articles. He is the founder of the Geometric Image Processing Lab. and a founder and advisor of several successful image processing and analysis companies. Professor Tai Xue-Cheng is a member of the Department of Mathematics at the Hong Kong Baptist University, Hong Kong and also the University of Bergen of Norway. His research interests include Numerical partial differential equations, optimization techniques, inverse problems, and image processing. He is the winner for several prizes for his contributions to scientific computing and innovative researches for image processing. He served as organizing and program committee members for many international conferences and has been often invited for international conferences. He has served as referee and reviewers for many premier conferences and journals.